Congratulations to Jacqui Donnelly who won our competition last month for an overnight stay at Crab Manor hotel. We hope you enjoy your stay Jacqui and enjoy your champagne! 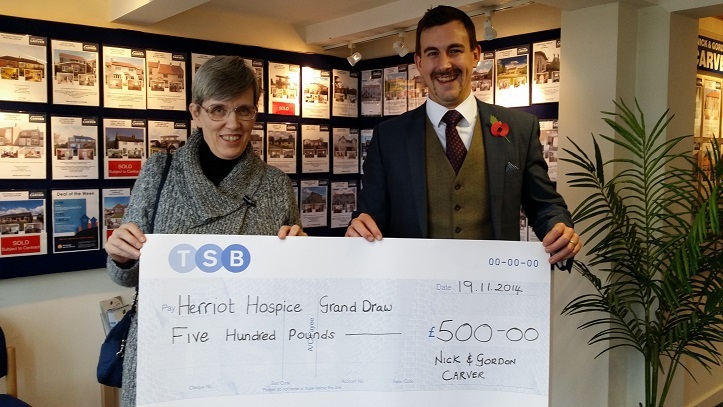 So nice to hear that we managed to help Herriot Hospice raise over &2,500!! We donated the first prize of &500 in their grand prize draw, to attract people to buy tickets for this great cause. James Carver (please excuse his Movember Tash) presented the winning cheque to the winner, Claire Brown, last week.